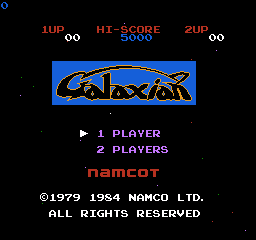 Galaxian is a game featuring Galaxians attacking Galaxians and Galaxians (flagships). Nobody really knows who's who, other than your mission is ostensibly to destroy aliens. HARUHISA UDAGAWA is used as the soft-reset RAM check (at $105) as well. Haruhisa Udagawa seems to have been a programmer for Namco, as his name appears in some other games such as Lupin Sansei: Pandora no Isan. There are two methods to enable this player. For the first one, reset the game 44 times, hold A + B on Controller 2, and reset again. For the second one, reset the game only 10 times, then shout 4 times to the microphone on the Famicom Controller 2. The reset counter is located at the RAM address $115. There are a total of five songs accessible by this method, all embedded in the CHR data. Song data is highlighted in blue. Numbers indicate the order they play in. The music player uses RAM set as the sprite DMA area, so as the song plays a sprite will scroll down the screen, indicating the current playing notes and the progress through the song. A 1 will randomly flip while going across the screen, but this has no impact on anything. Resetting before the song fully ends will increment a counter in RAM, with the next song playing after another 45 resets. When using the second method, to reach the second melody you need only 34 resets, because the first 10 you already did. If at any time the song is allowed to finish fully, the game will reset back to the title screen. After another 256 resets from when the player is enabled, the game is reset to the title screen. Some of the tracks are next to graphics that are actually used, and will play garbage before or after the music is played. At least one of the tracks is a recreation of another song, but it's unknown what most of them are. "Ma reine de Saba", composed by Michel Laurent. "Nausicaä Requiem", a song from the film Nausicaä of the Valley of the Wind which was released the same year as Galaxian, composed by Joe Hisaishi. The last song is not a complete one, but can be binded to the first song as an intro. Note that some of the music is played from the garbage graphic data rather than the right beginning, and keeps playing garbage after the music is over. These clips have been cut down to remove said garbage. The player's shoot sound is a simple sound effect. The generating routine consists of two parts. 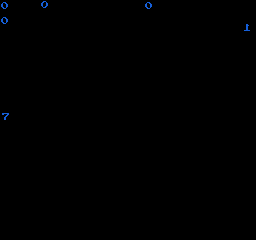 The first one setting once the pulse and noise channel frequencies, duration and envelope. Judging from the code, the second part should be called with every sync and change the noise channel duration period in time. But for unknown reason the duration counter in the second generating routine set to 0 in any cases after the first execution, so this routine never called again. If we modify the second generating routine to actually count the duration periods in time, we'll get the different shot sound. Remains unknown, if it were modified to be more like in the final version, or just by accidentally programming mistake changed from the desired version. Below is the original and the fixed versions of this sound effect. There are no fixes in this sound effect made in the FDS version of this game released 6 years later, the routines are identical in both versions. This page was last modified on 30 April 2017, at 07:33.